Curbless walk in showers are becoming all the rage in bathroom remodeling today but the real question should be, “Is a curbless shower the best option for your bathroom?” While some clothing products are marketed as “one size fits all,” this is not the right strategy for choosing a shower. From my experience as an owner of a remodeling and national construction products supply company I have lived the debate of a curbless vs. a standard shower pan with a curb countless times. My goal with this article is to not only provide you with the advantages and disadvantages of a curbless shower, but also to offer some product selection tips to make a long-lasting shower you’ll enjoy using and looking at. 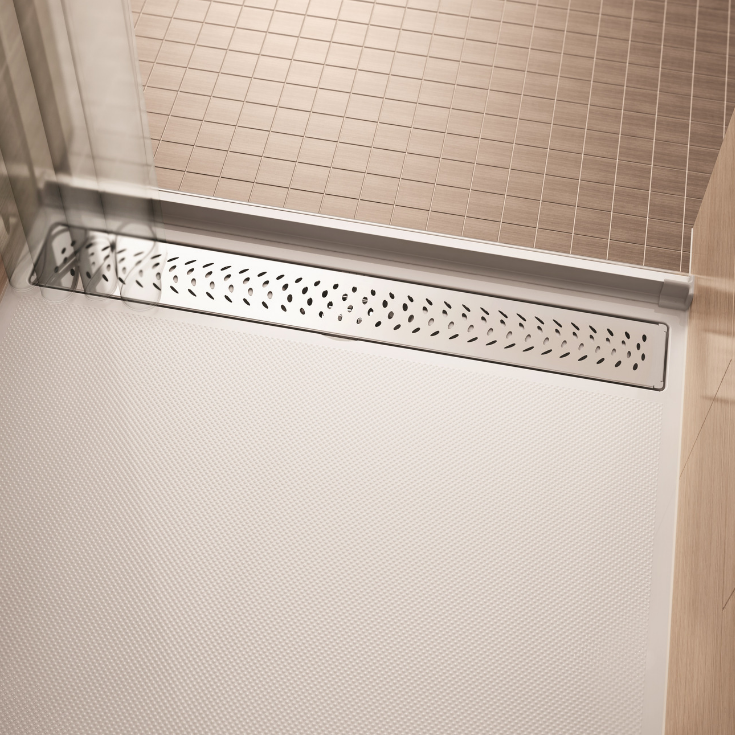 Now – let’s take a look at the pros and cons of barrier free showers. Functionality for everyone from grandkids to grandparents – As health care costs continue to skyrocket and multiple generations living under the same roof is a growing reality for many American families, it is more important now than ever before to have a bathroom which will work for all members of the family. A 4” tall shower curb which is a cinch for a teenager to step over can be a mountaintop for their grandmother. Eliminating a curb makes the shower an “equal opportunity” space. 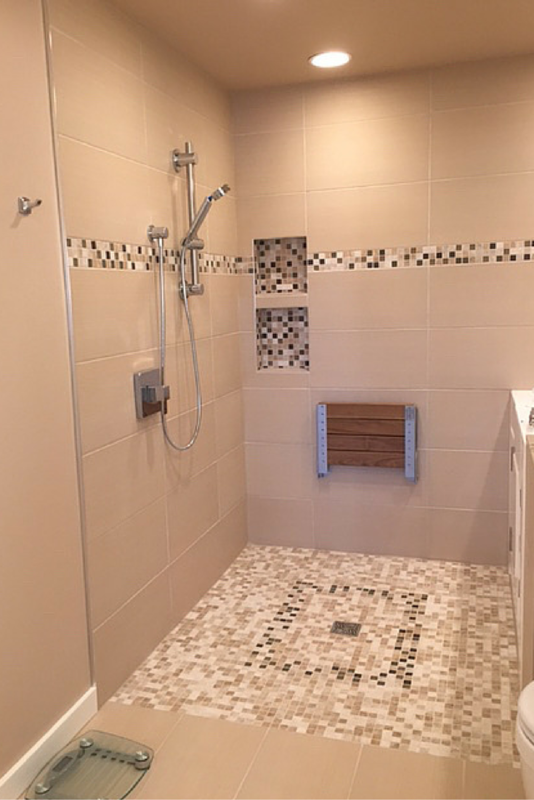 • Product selection tip – An easy (and waterproof) way to make a one level shower possible is by using a shower base former and wet room system. This system can be installed directly on the joists of the home. Easier to clean than a shower enclosure – Cleaning a small corner or alcove shower enclosure can be a difficult elbow-bruising experience. After eliminating a curb the shower space is effectively opened up to the bathroom making it easier to reach in and clean. • Product selection tip – A hand held shower with a hose can make cleaning easier and reduce the need to bend over as well. Show off your cool looking shower – A shower enclosure with a curb and a door physically cuts off the view to intricate stone, tile or decorative wall panels. An open barrier free shower provides sight lines into the wet area which can show off a luxury shower. Maximize every square inch – My wife’s grandfather in Italy had a curbless one level shower in a bathroom which only measured 4’ x 6’. This utilitarian space did not have a separate space for a shower. The room simply had mounted to the walls a shower head, vanity and a toilet. 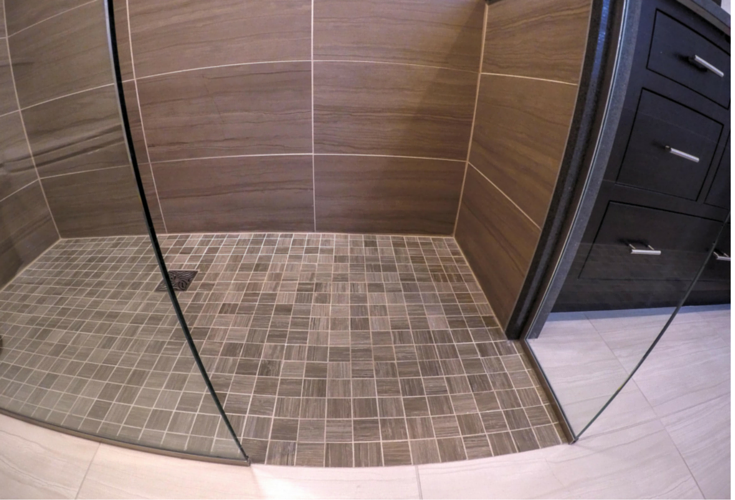 While your shower doesn’t need to be this basic – it’s nice to know in small bathrooms you can increase the effective use of space by eliminating the barrier of an enclosure and a curbed shower base. Eliminates the cost and hassle of a shower door – Cleaning shower doors can be time-consuming and the cost of shower doors is not cheap. A curbless walk in shower gets rid of the need (and cost) of the shower door. They can be put in small spaces- While it’s nice to have a large shower, not all us have the space we’d like. However, just because you want (or need) a curbless shower doesn’t need you have to have the space you’d find in a million dollar home. The acrylic roll in shower below shows how this is possible in a small area. 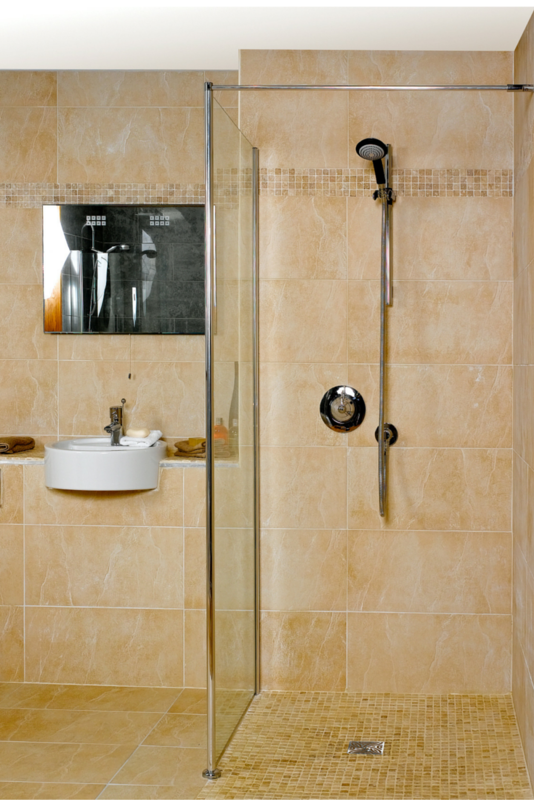 Too little privacy – Since a curbless shower is open it does not offer as much privacy as a shower enclosure. It is possible to minimize this problem by using obscure glass, glass blocks or curtains. Water can get out – A challenge with a curbless shower is there is no curb to hold the water into the wet area. 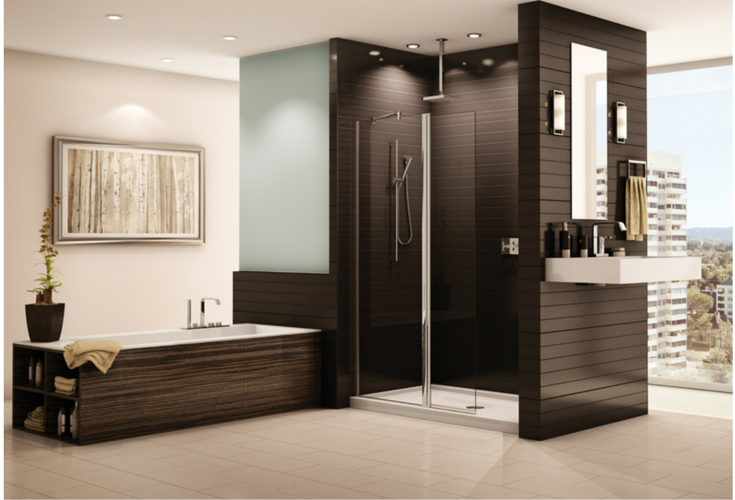 This problem can be lessened by finding the right product(s) to make an open shower work. 1. 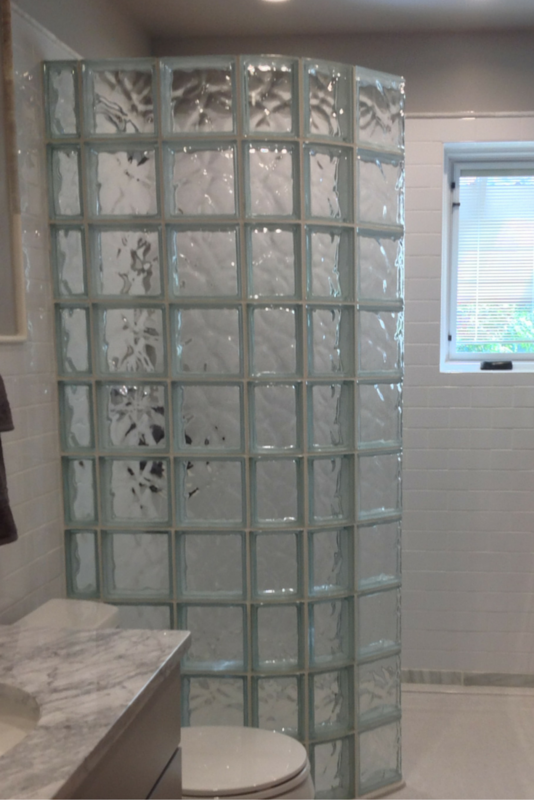 A curved glass block shower wall – The bend in the glass block wall will move water back to the drain. 2. Pivoting shower screen – A shower screen can have a door which pivots both inside and outside the wet area. This pivoting door can be slightly tilted to the inside to keep water in while showering and can be pivoted outside when getting out. 3. Rain head – The rain head keeps the water in a more concentrated spot vs. a wall-mounted shower head (note- the pressure on rain heads has improved vastly since they were first introduced). Heat will escape the shower making it colder – This is certainly a drawback since there is an opening in a shower without a door. A way to keep the space warmer is to use heated flooring. 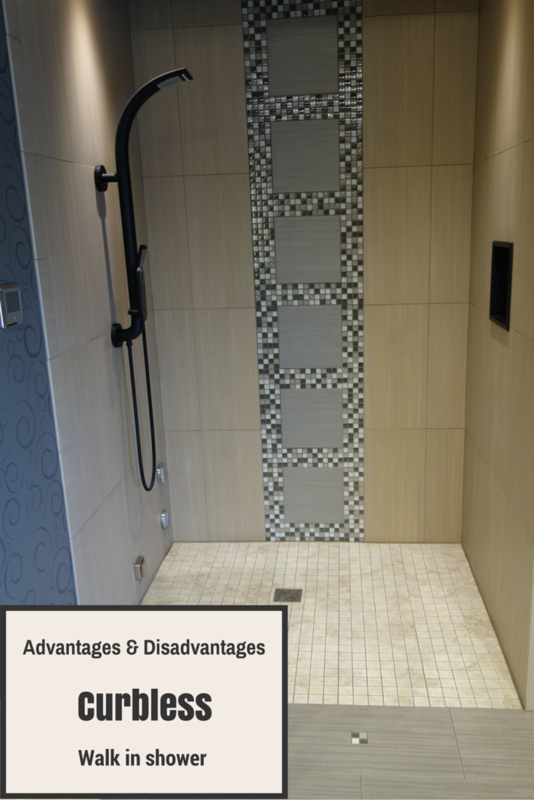 Given these advantages and disadvantages what do you think about a curbless shower for your home? Are you a friend of foe of this type of project? Please comment below or call for a free design consultation or for information about products to make a curbless shower a reality. Nationwide supply on shower wall panel systems is available through Innovate Building Solutions (877-668-5888) or regional installation The Bath Doctor in Cleveland (216-531-6085) or Columbus (614-252-7294). Follow the author on Twitter @Mike_Foti or his company @InnovateBuild. My husband and I are 73 years old and about to have our master bath remodeled. Our 20 year old home was built on a slab. We would like a curb less shower but was told that jackhammering the slab could comprise the structure of our foundation and our home. Can you shed any light on this issue? Thank you very much. Just wondering if you put a long drain in front of curbless shower opening would this help. The water would flow into the drain and minimize water on floor. 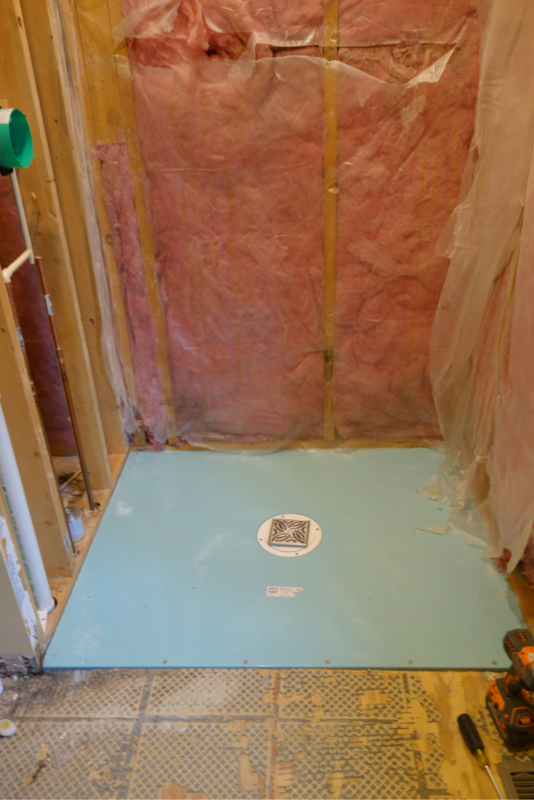 We recently had a bathrioom 7×8 covered to a wet room to accommodate a wheelchair. By far the best design choice EVER. The key to not having water draining out of the space is the correct slope of the floor and the right material choices – we chose a channel drain along the back wall. Yes, the room itself gets moist/wet (not saturated). I spend 3 minutes with a microfiber towel, quickly wiping down walls and floor after my shower, and walla… clean bathroom that requires very little maintenance except scrubbing toilet. My bathroom has never been cleaner. Heated floors also help with the heat dissipation/ cold issue. LOVE our wet room. Can the shower base former and wet room system be used in a basement? Can you give me the name/info for the large wall tile and the floor tile in your example #3, suggesting the use of a rain head shower? Love your website! Thanks! Is there any treshold or clear strip to prevent from that issue ? Mike, Thank you for these suggestions – they are a huge help in designing my modest 1300-1400 sqft. floorpan. I would love a curbless shower for the master bath with an exterior door that leads to a side deck off of the MBR. No neighbors will ever be on the MBR side of house. So far I have found very few practical (budget wise) examples of exterior doors on showers. The house will be in a coastal town of SC – so it will be on pilings. I’d also like the option of a temporary shower curtain for the 2-3 weeks of cold weather. Am I crazy? I am interested in a zero entry shower to age in place. I have a one story ranch built in 1952. I live in TX in a place with clay soil that has a lot of movement. Contractors have told me that the type of shower I want will not work. Comments? We are in the midst of a DIY remodel on our 12yo house and we are planning to gut our entire bathroom and redo our ugly small walled neo angle shower with a curbless glass neo angle shower. We really are dead set on the curbless and from people I’ve spoken to our bathroom is a perfect candidate for one, however I am having trouble finding someone who is willing to come out and do the sloping and all of that (I’m handy but not all that familiar with laying the base of a shower) without doing the tile, as we are going to do the tile ourselves. Bathroom remodel companies have told me the job is too small. Do you know what kind of contractor/company I should be looking into for this? We want to have the pride of doing most of our house ourselves but we do know our limitations, and I’ll never blow a bunch of money to have someone come do something to my house that I’m capable of doing myself aka the majority of the remodel. We really don’t want a curb on our shower! I’ve seen curbbless showers in hotels and new homes. I want one for our smallish matter bath! I’m researching now, especially looking for dimensions. Can I get one to fit our room. Thanks for your thoughts on pros and cons. Tommy and Barbara – I’m sorry to hear you’re having problems with your builder. Yes with a one level wet room system it is possible to put a product called a “shower base former” directly on the joists (the builder would simply cut out the subfloor and put this product directly on the joists). I will include a link to the web page for this product (along with the waterproofing kit which is part of this system below). Let me know if I can help you further. Lou – I’m glad this project worked out so well for you. We have also seen the popularity of curbless one level showers grow dramatically. They look cooler, more contemporary and they are safer. 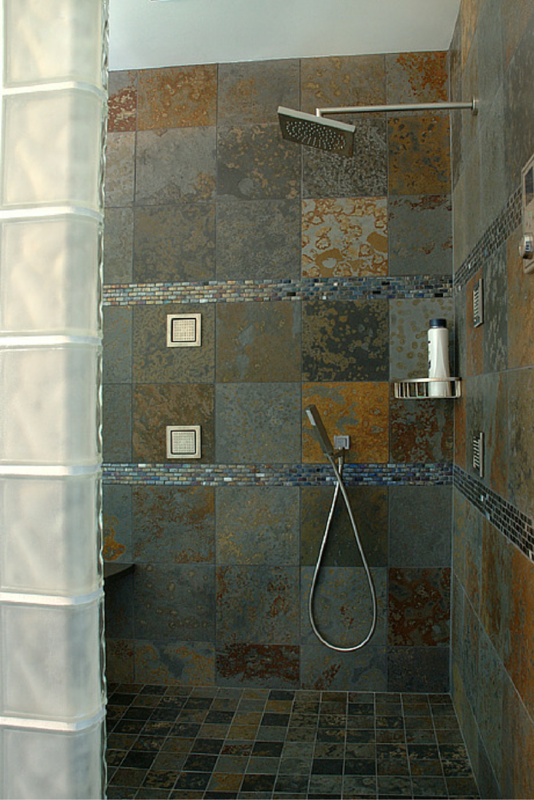 My first curbless designed shower I completed a little over 2 years ago was a hit with the homeowner! I just recently received an email from them and they said that it was the best money they had ever spent! The exect same thing happened to me in Europe Mary. I soon found out why the room smelt musty. I turned around after my shower to find the bedroom carpet was saturated. Mary – I’m sorry you had a bad experience with curbless showers. They are not for everyone…but with that being said I would guess whoever designed the space did not think through where to place the drain so you didn’t have this problem. We stayed in several upscale hotels in Europe with curbless showers. Boy, did we get tired of water flowing all over the bathroom floor and into the bedroom. We had to use all the towels they gave us to mop up the mess. One time, I slipped on the wet floor and barely escaped serious injury. This is a cheapo-solution that I would walk away from if I found it in a house I was thinking of buying.